States seek to wring opportunity from BP disaster. 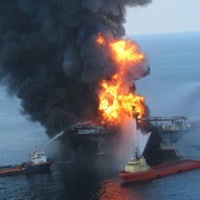 The explosion of the Deepwater Horizon rig in April 2010 triggered a massive oil spill that devastated Gulf commerce. Last spring, when BP reneged on its Settlement Agreement and stopped paying damages to small businesses that had agreed not to sue over the worst oil spill in history, you might have expected the U.S. Chamber of Commerce to rush to the defense of struggling Gulf Coast commerce. You’d have been wrong. The national chamber — as distinguished from local chambers of commerce — has betrayed them. Kelly Toney is a small business owner in Cape Coral, Fla., a suburb of Ft. Myers. Like businesses all across the Gulf and especially in Louisiana, hers was devastated when the 2010 summer tourism season was derailed by BP’s Deepwater Horizon blowout, explosion and subsequent environmental disaster. With oil appearing on the beaches of northwest Florida, it was assumed to be only a matter of time before the Loop Current would smear the mess across famed Southwest Florida beaches such as Sanibel and Captiva. In anticipation, tourists went elsewhere, particularly affluent Europeans with their fat wallets. The economic result was a near fatal blow to the area’s nascent post-recession recovery. The story was the same throughout the Gulf region. Toney did what most successful entrepreneurs do, she hunkered down, cut costs, put in more hours, and otherwise persevered. Fortunately she made it. Because of her efforts, Servpro of Cape Coral, a facilities maintenance service provider, is thriving, though it was touch and go for many months following BP’s spill. As a member of several local chambers of commerce, Toney and fellow survivors of the spill would gather at chamber events to commiserate, support the downtrodden, and otherwise plot their return to profitability. The neighborhood chamber holds a special place in American entrepreneurial lore. Local chambers are the lifeblood of Main Street. They represent all that remains fiscally wholesome in a modern, oligarchical economy that too often rewards (or punishes) quarterly numbers — long-term consequences be damned. Local Chambers of Commerce still champion the Main Street merchant as opposed to the Wall Street financier. In short, local chambers provide crucial support for the American dream. More colloquially, one might expect the U.S. Chamber to have been guided by the maxim that a deal’s a deal. While Toney happily pays dues to the Chamber of Commerce of Cape Coral (her local chapter), she had no idea that a portion of those dues was going to support an organization whose mission is anything but furtherance of the entrepreneur’s American dream. The U.S. Chamber of Commerce, in cooperation with the U.S. Hispanic Chamber of Commerce and the National Association of Manufacturers, filed an amicus brief in late March in support of BP’s latest attempt to renege on its Settlement Agreement with individuals and businesses of the Gulf Coast – including Toney’s. In short, the U.S. Chamber of Commerce is actively seeking to block compensation rightfully due to thousands of small-businesses along the Gulf coast who were devastated by BP’s negligence. These businesses had filed claims under the BP Deepwater Horizon Economic Loss Court Supervised Settlement Program – the CSSP. In 2012 BP agreed to settle claims with individuals and companies that suffered a financial loss as a result of the spill. The 1,200-page Settlement Agreement, negotiated over a period of several months by dozens of the country’s top legal minds, created a set of objective requirements and formulas to determine eligibility and payment amount. In support of judicial approval of the compromise, for months BP touted the Settlement Agreement as the best thing since sliced bread. The company was desperate to mitigate its liability, both civil and criminal at the time, and the Settlement Agreement would resolve most of the civil lawsuits. In addition, BP hoped a good-faith compromise with small business would help it win favor with the U.S. Department of Justice, which was prosecuting the company for criminal violations associated with the Deepwater Horizon disaster. BP’s counsel at the time, Richard Godfrey, encouraged all those affected by the spill to file claims through the CSSP under the terms of the Settlement Agreement and not to fight the company in court. If they didn’t follow his advice and filed suit, Godfrey threatened to “put them to their proof.” It was a not-so-subtle suggestion that businesses with economic losses resulting from the spill should rely on BP’s settlement program, in which the company could objectively quantify its liabilities, rather than sue (a process in which BP’s financial hit would be almost impossible to predict). To date, over 200,000 businesses and individuals have filed claims with the CSSP. With court approval of the deal in hand, and the date to opt out of the program having passed, BP decided to pull the rug out from under the economy of the Gulf of Mexico. Within days of court approval, BP began efforts to undermine the deal by arguing that compensation formulas were being misinterpreted, with claimants receiving windfall payments. In addition, at the suggestion of 5th U.S. Circuit Court of Appeals Judge Edith Brown Clement, BP began arguing that business claimants should have to prove loss associated with the spill in a manner inconsistent with the Settlement Agreement. It already required claims to be supported by evidence that damages were caused by the spill, rules that BP stipulated to and admitted were sufficient. Yet suddenly, BP wanted something more from claimants. These legal machinations resulted in the issuance of an injunction prohibiting the satisfaction of any and all business loss claims. Not a dime has been paid to any business since last October. Approaching the four-year anniversary of the disaster, businesses that thought they settled with BP in order to avoid protracted legal battles now find themselves in the mother of all such battles. That said, to date BP has lost most of its legal challenges. Claims administrator Patrick Juneau, trial court Judge Carl Barbier, and two panels of judges on the 5th Circuit have variously called BP’s complaints and charges “nonsensical,” “patently untrue,” and “deeply disappointing.” Nevertheless the company continues with its delay, deny and defend tactics by filing appeal after appeal. Against this backdrop, there’s every reason to expect the U.S. Chamber of Commerce to seek to intervene – not with BP, but rather on the side of the business victims of BP’s criminal wrongdoing in the Gulf. After all, we’re talking about the U.S. Chamber of Commerce and these U.S. businesses were injured by a foreign corporation. Not to mention that the sanctity of contract is a fundamental principle for the U.S. Chamber of Commerce and all American business executives. More colloquially, one might expect the U.S. Chamber to have been guided by the maxim that a deal’s a deal. Yet the U.S. Chamber came out swinging in support of BP’s absurd position. With this one amicus filing, the U.S. Chamber of Commerce showed its true colors as a puppet of big business — more accurately, the puppet of one very big foreign business. Outraged, Toney of Servpro sent the Chamber of Commerce of Cape Coral a letter detailing the U.S. Chamber’s sellout. Calling the move a “slap in the face,” “unconscionable,” and “disheartening,” Toney asked Cape Coral to reconsider its relationship with the national organization. Unfortunately, Toney’s complaints will all but certainly fall on deaf ears. On its website, the U.S. Chamber of Commerce says it represents “the interests of more than 3 million businesses of all sizes, sectors, and regions. Our members range from mom-and-pop shops and local chambers to leading industry associations and large corporations.” But in 2012, only 1,500 entities provided 94 percent of its contributions, and more than half of those contributions came from just 64 donors. So the bulk of the U.S. Chamber’s funding seems to come from a handful of large, well-funded corporate concerns. One can only assume that when the chief executive of one of those 64 companies calls for U.S. Chamber action, as BP most certainly did here, the interests of the other 2,999,936 members, including Kelly Toney, are given short shrift. Tom Young is an attorney in Tampa with a practice dedicated exclusively to representing businesses in the BP Deepwater Horizon Court Supervised Settlement Program and related litigation. To find out if a local Chamber of Commerce is affiliated with The U.S. Chamber of Commerce, visit www.uschamber.com/chamber/directory.